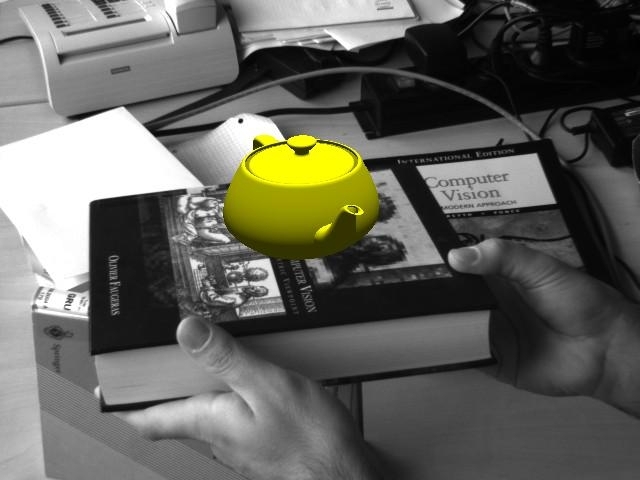 RecFusion is a real-time 3D reconstruction software for RGB-D sensors! There is also a C++ SDK available for integrating real-time 3D reconstruction into your own applications. For more information visit the RecFusion homepage. My research interests include 3D reconstruction from multiple views and optical tracking. 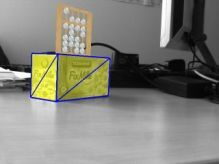 In this project, we are interested in the fundamental problem of simultaneously tracking a piecewise-planar scene and accurately estimating the 3D displacement of the camera. The objective is to have an algorithm with a higher convergence frequency and a higher convergence rate than standard optimization methods while having an equivalent computational complexity. Since the tracking is aimed to be used in industrial real-time augmented reality applications, in addition to the robustness and the speed performance, the algorithm should be very precise. For some applications, we are investigating alternatives where an off-line learning step improves the efficiency and the convergence properties of the tracking algorithm. We are working on a real-time 3D reconstruction system aimed at recovering the 3D shape of objects inside a working area using only camera images. The working area is observed by 16 cameras mounted on the ceiling. Using these images we reconstruct an occupancy map and extract individual objects. The long-term goal of the project is to use this occupancy map to detect possible collisions between a robot placed in the working area and other objects in its path. In this project a complete real-time model-based tracking system for piecewise-planar objects which combines template-based and feature-based approaches is being developed. The main contributions are an extension to the ESM algorithm used for template-based tracking and the formulation of a feature-based tracking approach, which is specifically tailored for use in a real-time setting. In order to cope with highly dynamic scenarios, such as illumination changes, partial occlusions and fast object movement, the system adaptively switches between template-based tracking, feature-based tracking and a global initialization phase. The tracking system achieves real-time performance by applying a coarse-to-fine optimization approach and includes means to detect a loss of track. This project targets the worklow analysis of an interventional room equipped with 16 cameras fixed on the ceiling. 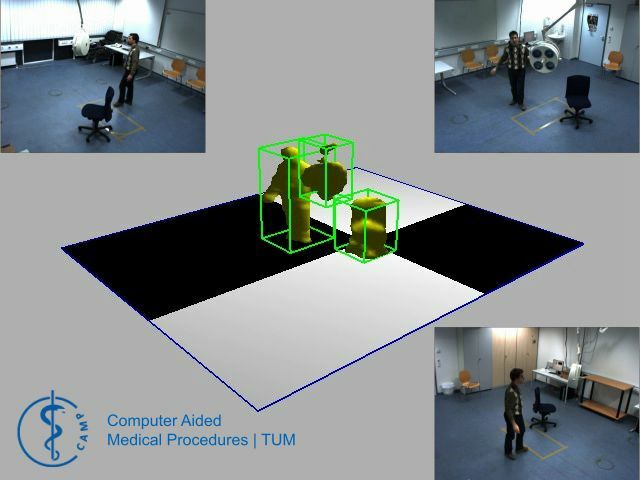 It uses real-time 3D reconstruction data and information from other available sensors to recognize objects, persons and actions. This provides complementary information to specific procedure analysis for the development of intelligent and context-aware support systems in surgical environments.